In this last series, we elaborated on the importance of avoiding any innovation inserted into the oral sanad and the ways in which this is done when using logic (a corrupted analogy or قياس فاسد) or by misunderstanding the textual evidences. This new series is a natural offshoot to that one where we now begin our analysis of different innovations which have entered the recitation in a similar fashion. Remember that mistakes or misconceptions in the recitation start with one individual and do not represent the opinion of the vast majority of trustworthy and reliable Qurra’. This one individual passes on this misconception to his students, and he/she may have many of them. Through these students, the mistake spreads, until finally those who have felt doubt regarding it trace it back and link it to this one individual, unable to trace it to textual evidences or even the Prophet صلى الله عليه وسلم himself. The investigation we discuss today took a similar path. So we start today with a tale… a tale of two Sukoons. While some parts of this post may be a little technical, we urge our readers to patiently read through it thoroughly, for there are many points of benefit and clarification for both the student and teacher of the Qur’an. The portion highlighted in red above shows where the two Saakin letters appear together. The ( – ) shows that the first ن was dropped, and a Shaddah was added to the second ن (which looks like this: نْ + نُ in Step 2). As soon as that happened, then in the final scenario, two Saakin letters appear consecutively (blue). b. Apply إخفاء (also known as “Ikhtilaas” as explained below): the last letter of the first word (مُدْغَم) is recited with a fraction of its original Harakah, so in the case of نحنُ نسبح, only a fraction of the dhammah of the first ن is articulated. Part A: Referring to situation #1 above, a certain group claims that when stopping on two Saakin letters, one applies a portion of the Harakah from the letter before to the first Saakin letter. So for example, in the word الفتح, since the Harakah which precedes the first Saakin letter (ت) is a fat-hah (فَ), a portion of this Harakah gets transferred to the ت, as if to say الفَتَح, the second fat-hah being shorter in length than the first. 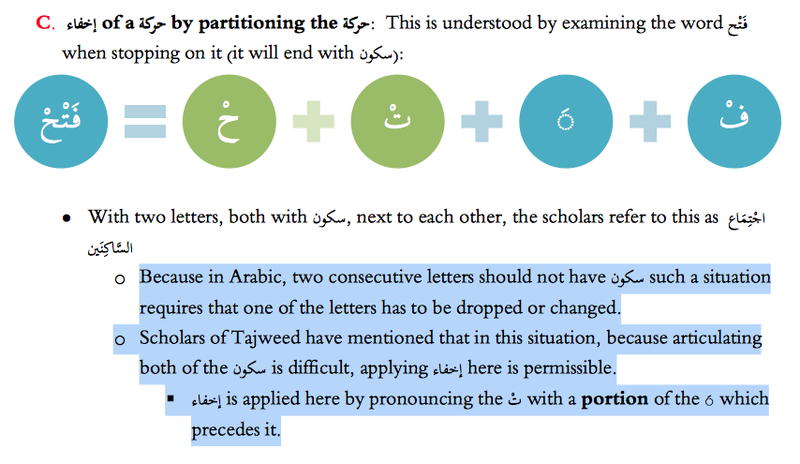 As can be seen clearly, students were taught that the Harakah was “partitioned” and assigned to the first Saakin letter with the premiss that since pronouncing two Saakin letters consecutively was “difficult,” scholars of Tajweed had allowed this other way to be recited. The students were also given a name for this; they were told it was called Ikhtilaas (explained below). The second evidence they use is that they wrongfully attribute this opinion to Sh. Khalid Ahmad Barakaat حفظه الله and by doing so, they are “claiming” to have an oral Sanad for it (as will be made clear below). And finally, that last bit of evidence proponents of this opinion will use is logic: they claim that because saying two Saakin letters together is difficult, a portion of a Harakah is “naturally” needed. They explain this by saying that when we say a letter with Sukoon, we are “closing in” on the Makhraj. If we are to say another letter with Sukoon after it, this would require us to first “open” and then “close” in on the next Makhraj. So let’s examine these evidences and see whether or not there’s any support, even a little bit, for these two claims. Is the Logic used here really Logical? First, let’s start with the way this group tries to “logically” justify this opinion. We’ve mentioned repeatedly that the recitation is one of the kinds of علم نقلي, knowledge that can only be learned from a teacher. Therefore, we cannot “logically” justify anything until and unless it has been backed up by the oral transmission and textual evidence in light of that oral transmission. But let’s say we were to accept this opinion from a logical perspective. In this case then, it’s not about “closing” on a Makhraj and “opening” in order to “close in” on another Makhraj. It’s about sliding from one Makhraj to the next, as we mention at the end of this article regarding correct technique. This requires the training and practice under a qualified teacher. The letter must have a Harakah, not Sukoon, for the Ikhtilaas to be applied. It is also referred to as إخفاء or رَوم in many books of Qiraa’aat. It is a very specific rule only applied to specific words and situations (mentioned below). It is applied in the middle of a word, and in the case of إدغام كبير, it is applied between the two words, and never when stopping. what remains of Harakah is less than what was omitted. is when what remains of the Harakah is more than what was omitted, as if 2/3 remains, and what was omitted was very little. It’s obvious from the above that Ikhtilaas (as well as Rawm) refers to the Harakah that already accompanies a letter; it is not “borrowed” from the letter before it, nor is it applicable to a Saakin letter. Since Ikhtilaas is originally applied to a letter that already has a Harakah, applying Ikhtilaas to an already Saakin letter actually changes the meaning of the word or makes even meaningless. For example, when stopping on the word أَمْر, if one does Ikhtilaas of the م by assigning a portion of the fat-hah before it, you’ve essentially changed the word from أمْر (“a matter”) to أمَر (“he commanded”). This is a major mistake (لحن جلي) and absolutely Haraam. This shows that the nature of Arabic language is such that any sort of minute change can completely affect the meaning or make it meaningless. That’s why it is absolutely essential to make sure every Harakah and letter is pronounced accurately and as they should be. Because this sort of change affects the meaning, only Allah can authorize such a change as He has done in other Qiraa’aat. That’s why there are only specific words that have Ikhtilaas applied to it, with very specific conditions. And indeed, there is among them a party who alter the Scripture with their tongues so you may think it is from the Scripture, but it is not from the Scripture. And they say, “This is from Allah ,” but it is not from Allah . And they speak untruth about Allah while they know. The reciter of the Qur’an should beware of such a travesty in the recitation. Ikhtilaas should not be applied when stopping on two Saakin letters, and therefore, there is neither evidence for it, nor justification. …is difficult; and with Ikhfaa’ he strikes the joint (separating the two). Imam al-Shatibi, when mentioning this line, was only (and originally) referring to the Idgham Kabeer of Abu ‘Amr, nothing else (i.e. he wasn’t referring to stopping on two Saakin letters). “…and with Ikhfaa’ he strikes the joint (separating the two)” refers to the idea that applying Ikhfaa’ essentially “breaks” the Idgham between two letters. It’s crystal clear from this that Ikhfaa’ (or Ikhtilaas) is applied at the end of the first word (i.e. between both words). Without the need of any explanation of this line, it is unequivocally clear that the Ikhfaa’ takes place on the Mudgham letter only (the place of the “joint”). However, the group claimed that Ikhtilaas is applied to the Saakin letter before the مُدْغَم. This opinion is an innovation, mentioned in none of the texts on this subject, especially on the explanation of the line above from al-Shatibi’s poem. There is an agreement amongst the Qurra’ that there are only two confirmed ways this إدغام كبير is pronounced: a pure إدغام or إخفاء (ikhtilaas) of the Mudgham letter only; there is no third way. The meaning [is that] when there precedes before this letter which is inserted into other than it, a letter which has a permanent Sukoon, then there are two ways amongst the reciters: the old school way and it is that the Mudgham letter is inserted into the other one a complete and pure Idgham. And the new school way is that this pure Idgham is difficult to pronounce because it involves the coming together of two Saakin letters, since the Mudgham letter must have a Sukoon added to it. In this case, the way of applying Idgham according to this way is to do Ikhfaa’ and Ikhtilaas of its Harakah, which was referred to as Rawm in his (al-Shatibi’s) statement, “And apply Ishmam and Rawm (line 24).” The author (al-Shatibi) follows this opinion of the new school and said, “and with Ikhfaa’ he strikes the joint (separating the two).” The command is directed to the reciter, for when he applies Ikhfaa’ to this letter, then he has achieved that which is correct. …and the way of most of the later scholars of the recitation: and that is Ikhtilaas of its Harakah and not a pure Idgham. The above is clear that Ikhtilaas is only applied to a letter with a Harakah, and no Sukoon is mentioned. فلذلك اختار المتأخرون من أهل الأداء عن السوسي الاختلاس، والمذهبان صحيحان مقروء بهما. وأما كيفية النطق بالاختلاس فلا تضبط إلا بالمشافهة والتلقي عن الماشيخ. First: the old school way from the reciters which is a pure Idgham. Second: the new school way and it is to apply Ikhtilaas of the Harakah of the Mudgham letter so that two Saakin letters don’t meet. This is because the Mudgham letter must be Saakin before Idgham can take place; so when it is preceded by a Saakin letter, then two Sukoons appear consecutively. For this reason, those who follow the new way from the reciters on the authority of al-Soosi apply Ikhtilaas, and both ways are confirmed and recited. As for how to apply Ikhtilaas, then it is not perfected except through verbal training under the qualified teachers. If a permanent Sukoon precedes the letter which is inserted (Idgham) into other than it (referring to the Mudgham letter), then its Idgham is difficult, meaning it is difficult to pronounce it because of the presence of two Saakin letters found together. Therefore, the author (al-Shatibi) preferred to apply Ikhfaa’ by saying, “And with Ikhfaa’ he strikes the joint.” The pronoun (he) refers to the reciter when he applies Ikhfaa’, he will be correct, and it (this statement) is derived from the saying, “The sword struck and separated the joint (between two bones),” and mentioned that it (the Mudgham letter in this scenario) is preceded by a permanent Sukoon. 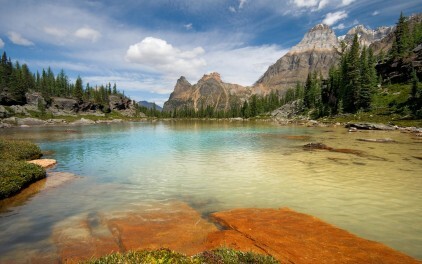 وإن كان الساكن صحيحا عسر الإدغام معه، لكونه جمعا بين ساكنين ، ليس أولهما حرف علة ، وذلك نحو (شهر رمضان ) (العفو وأمر) (زادته هذه) (المهد صبيا). وفيه طريقان ثابتان صحيحان مأخوذ بهما: طريق المتقدمين ، إدغامه إدغاما صحيحا ، قال الحافظ البارع المتقن الشمس ابن الجزري : والإدغام الصحيح هو الثابت عند قدماء الأئمة من أهل الأداء ، والنصوص مجتمعة عليه. The way of the early scholars: Idgham with a pure Idgham (dropping the first letter and adding a shaddah to the second). The great scholar Ibn al-Jazari said, “And the authentic Idgham is established amongst the earlier Imams of the reciters and the texts convene upon this. The second way is for most of the later scholars, that it (the Mudgham letter) is “hidden”, meaning the Harakah has Ikhtilaas applied to it and it is [also] called Rawm, which will come shortly, and it is in reality a third category, not Idgham, not Idh-haar, and it is not referring to al-Ikhfaa’ as mentioned with regarding to the chapter on the Noon Saakin and Tanween. And their escaping from the pure Idgham is due to the [difficulty of pronouncing] two Saakin letters when they meet. Aside from the fact that al-Shatibi’s line is clear in and of itself, that the إخفاء takes place at the point of separation between the two words, meaning at the end of the first word where Idgham originally joins both words together, it’s clear from all the authors’ clarification that Imam al-Shatibi was not referring to the Saakin letter itself, but the Mudgham letter. There is no mention of this so called third opinion (Ikhtilaas of the Saakin letter preceding the Mudgham) and therefore, there is no difference of opinion on this issue, and Allah knows best. …so take that which is approved responsibly. Now that we’ve established the lack of textual evidence for both of the claims made above, let’s move on to examining the oral references.
. ماأكثر المدعين اليوم وماأكثر آفة النقل…. سأبسط الجواب وإن كان يحتاج إلى الشرح والتلقي مشافهة وخاصة ما يتعلق بالاختلاس والروم . فالروم هوخفض الصوت عند الوقف على الضمة أو الكسرة بحيث يذهب معظم صوتهما والباقي بمقدار الثلث والذاهب بمقدار الثلثين. خلافاللاختلاس.فكلمة الفتح يوقف فيها بسكون الحاء والروم سواء كانت مضمومة أومكسورة أما التاء قبلها فهي ساكنة مهموسة وشديدة فلما تختلس؟والاختلاس هوإذهاب ثلث الحركة فهل التاء متحركة أم ساكنة؟ فالاختلاس يكون وسط الكلمة نحو(فنعما.يهدي.خذ العغو وامر)ولكن في الروايات الأخرى وليس في كلمة الفتح شيئ لأحد من القراء. وأماقول الإمام الشاطبي:وإدغام حرف ……أي إذا كان قبل الحرف الذي يدغم في غيره حرف صحيح ساكن فإن إدغامه المحض عسير ﻷن المدغم لا بد من تسكينه فحقيقته ترجع إلى اﻹخفاء .وتسميته باﻹدغام مجاز .فرجح اﻹمام اﻹخفاء فقال :إذا أخفاه القارئ أصاب . فلايقاس هذا على ذاك ولايستدل به عليه.والله أعلم. وللسوسي في الحروف المدغمة الإدغام المحض والإدغام المحض مع الإشمام اوالإدغام الغير محض والمراد به الروم وهو الاتيان ببعض الحركة وقد يعبر عنه بالإخفاء. وأماإذاكان قبل الحرف الذي يدغم في غيره حرف صحيح ساكن ففيه مذهبان الإدغام المحض وهو مذهب المتقدمين.ومذهب المتأخرين إدغامه محضا عسير لما فيه من الجمع بين الساكنين إذالحرف المدغم لا بد من تسكينه فيكون المراد من إدغامه على مذهب المتأخرين إخفاءه واختلاس حركته المعبر عنه بالروم(واشمم ورم ….. I will expand my answer (to this question) even though it needs some further explanation and oral demonstration, especially when it has to do with Ikhtilaas and Rawm. Rawm is the lowering of the voice when stopping on a dhammah or kasrah whereby most of the sound drops, and what remains is 1/3 and what dropped was 2/3s. As opposed to Ikhtilaas. Therefore, the word الفتح, it is stopped on with Sukoon on the ح and with rawm regardless if it has a dhammah or a kasrah. As for the ت (before it) then it is Saakinah, articulated with Hams and Shiddah, so why would we apply Ikhtilaas here? Because Ikhtilaas is to say 1/3 of the Harakah. Does the ت come with a Harakah or is it Saakinah? Therefore, Ikhtilaas is applied (for letters which are) in the middle of a word, such as: فنعما يهدي خذ العفو وأمر, however this is only in other specific Riwaayaat, and there is nothing applied to the word الفتح for any of the Qurra’. As for the saying of Imam al-Shatibi: وإدغام حرف…., meaning, if there is a saakin letter before the mudgham letter, then the Idgham of this Mudgham letter is difficult; this is because the Mudgham letter must be saakinah. This is why the reality of it is then to recite it with Ikhfaa’. It is called Idgham figuratively here. This is why the Imam (al-Shatibi) preferred Ikhfaa’, that if the reciter did Ikhfaa’ (of the Mudgham letter), then he is correct. Therefore, this (line from the Imam) cannot have Qiyas applied to it (examples like الفتح or stopping on two Saakin letters), and it cannot be used as evidence for it, and Allah knows best. And for al-Soosi in the letters of Idgham, there is the pure Idgham along with Ishmam, as well as the Idgham which is not pure, and this refers to Rawm, which is articulating a portion of the Harakah and it is referred to as Ikhfaa’. As for the situation where this Mudgham letter is preceded by a Saakin letter, then there are two madhabs: the pure Idgham and this is the Madhhab of the early scholars, and the Madhhab of the later scholars is that the pure Idgham is difficult because of there being two sukoons, and the mudgham letter must be Saakin. So the intended meaning here, according to the Madhhab of the later scholars, is to do Ikhfaa’ and Ikhtilaas of the Harakah, what is referred to as Rawm (واشمم ورم). In addition to his clear statement, we even sought out recorded recitations of our teacher, Sh. Khalid, and found his pronunciation of these two consecutive Saakin letters when stopping were executed flawlessly. Our readers can check it here (note verse 8 of Surat al-Bayyinah, stopping on the word عنه), here (verse 1 of Surat al-Fath, stopping on the word الفتح), and here for the complete recitation of Surat al-‘Asr (note that the stop on the word الصبر involves the Qalqalah of the letter ب; this is not Ikhtilaas). …Ikhtilaas of the ت in [the word] الفتح and the ح of [the word] نحن (referring to نحن نسبح) is a detestable mistake and a baseless claim. It can never be correct and the recitation is not valid with it. Several students of Sh. Ayman Swayd were also consulted, and they replied in the same fashion: they had never heard of such a thing in their years of studying the recitation of the Qur’an. Now that we’ve established that the claims regarding the two Sukoons are unfounded, lacking support from oral transmission, it’s clear that the whole misunderstanding surrounding Ikhtilaas was the result of just that: a complete misunderstanding. For this reason, we advise teachers to be extremely critical of their students, to examine their understanding and knowledge thoroughly so that baseless claims about the recitation of the Qur’an can be prevented. Since Man is naturally prone to make mistakes, this extra precaution is essential. There is absolutely no textual evidence for it? There is no oral sanad for it? It is traced back to only one individual or group, and not the Prophet صلى الله عليه وسلم? Based on the above, Tawatur for this way of recitation has not be established (not even close)? Not a single group or Qari’ anywhere in the world besides this one group recites this way? …have been put in place for a reason: to ensure that no change of any kind, great or small, is made to the Book of Allah and to ensure that what we have authentically documented and preserved today is indeed the words of our Lord, and Allah knows best. In all circumstances, it is a teacher who has mastered the recitation who will be able to train the student in perfecting the pronunciation of two consecutive Saakin letters and applying the permissible ways of the إدغام كبير. While it takes a great deal of practice, one thing that students (and teachers) can keep in mind is that the attributes of شدة / بينية / رخوة (to be explained soon on this website) are very important to keep in mind in this situation, especially for that first Saakin letter. In light of the above, remember that to go from one Makhraj to the next for two Saakin letters requires “sliding” from one to the next by giving each letter its allotted time. Without this very important technique, a person could say the letters with Qalqalah or mix up the pronunciations of both letters. Don’t rush when trying to say both letters, because many reciters will have the tendency to say both letters at once. If each letter is given its proper right and allotted time, then it becomes very easy. Supplicate to Allah for we should never depend on our teachers or our selves only when perfecting our recitation. It is by Allah’s allowance and immense blessing that He facilitates His words to be uttered by our tongues. And finally, we wanted to close on this topic by reminding all those involved in teaching and propagating this innovation to fear Allah with regard to His Book and not to say about His speech that which is devoid of evidence or support of any kind. And as we mentioned before, no issue is too small or petty when it comes to the Qur’an, for if that were the case, then rules like Rawm, Ishmam and Ikhtilaas would have been ignored by our scholars. Those who have this attitude towards the Qur’an should fear Allah’s punishment for causing a change to His words! What is interesting to note is that reputable and trustworthy teachers who have learned from the sanad, do not ignore the two-consecutive-sukoon scenario that can appears at stopping, but in fact stress the importance of pronouncing that Sukoon clearly, which is the opposite of Harakah! Recitation (of the Qur’an) is Sunnah so recite it in the way that you find it. Follow (the recitation) and do not innovate because you have been sufficed (from doing so). I couldn’t open the file from the link of Sh. Khalid Barakaat website. Is there any other way I can listen to his recitation? Jazakillaahu Khayran for bringing this to our attention and we’ve corrected the links. They should work now, in sha Allah.